One of the Big Four UK broadband networks, Sky is best known for its satellite and on-demand TV services. matching Sky broadband deals available. Sky broadband deals available. Calls to UK landlines charged at 14.65p/min. UK Mobiles 14.25p/min weekend, 17p/min evening, 19.35p/min weekdays. The Bottom Line: You pay £27.95 the first month, then £18.00/mo for 17 months, then £31.00/mo. Inclusive evening and weekend calls to UK landlines, mobiles, 0845 and 0870 numbers. Monday – Friday, 7pm to 7am, plus all day Saturday and Sunday. The Bottom Line: You pay £32.95 the first month, then £23.00/mo for 17 months, then £36.00/mo. The Bottom Line: You pay £36.95 the first month, then £27.00/mo for 17 months, then £45.99/mo. Inclusive anytime calls to UK landlines, mobiles, 0845 and 0870 numbers. The Bottom Line: You pay £37.95 the first month, then £28.00/mo for 17 months, then £41.00/mo. The Bottom Line: You pay £41.95 the first month, then £32.00/mo for 17 months, then £50.99/mo. The Bottom Line: You pay £46.95 the first month, then £37.00/mo for 17 months, then £55.99/mo. Get 3 months free Spotify Premium! The Bottom Line: You pay £79.95 the first month, then £40.00/mo for 17 months, then £58.00/mo. The Bottom Line: You pay £84.95 the first month, then £45.00/mo for 17 months, then £63.00/mo. The Bottom Line: You pay £88.95 the first month, then £49.00/mo for 23 months, then £72.99/mo. The Bottom Line: You pay £89.95 the first month, then £50.00/mo for 17 months, then £68.00/mo. The Bottom Line: You pay £90.95 the first month, then £51.00/mo for 17 months, then £77.00/mo. HD - Includes Netflix - Get 3 months free Spotify Premium! The Bottom Line: You pay £91.95 the first month, then £52.00/mo for 17 months, then £70.00/mo. The Bottom Line: You pay £93.95 the first month, then £54.00/mo for 23 months, then £77.99/mo. HD Cinema - Get 3 months free Spotify Premium! The Bottom Line: You pay £95.95 the first month, then £56.00/mo for 17 months, then £82.00/mo. The Bottom Line: You pay £96.95 the first month, then £57.00/mo for 17 months, then £75.00/mo. Owned by tech mogul billionaire Rupert Murdoch, Sky has been providing premium sports and entertainment since the early 1990s. It launched broadband services in 2006 and now has over 6 million customers on its ADSL and fibre products in the UK. Sky often have prepaid iTunes, Amazon and Mastercard gift cards as one-off offers, usually around £50 in value, so if you’re considering Sky broadband it’s worth waiting for a good extra sweetener to drop. New customers will be required to verify their card details with an up front payment, usually £5. This payment will be credited to your account and taken off your first month’s bill. Prices are aimed at mid-market rather than budget or value. Customers are strongly encouraged to add extras to their account, like TV packages. From 1 March 2017, the standard monthly price of Sky Line Rental increased from £17.40 to £18.99. Line rental is now bundled in with the cost of broadband to give you one monthly price. Sky has a VIP service for new and returning customers which launched in August 2017, offering free tickets, exclusive TV previews and regular free prize draws. Longer-serving customers get access to three further tiers of offers. All new customers are eligible for the Silver VIP package. Sky offers ADSL up to 17Mbps using the Openreach network. Average UK download speeds for this product sit at around 11Mbps. Sky say that during the first 10 days of setting up a new ADSL connection, download speeds will be limited and will fluctuate. New customers may see limited speeds of 4Mbps during this “settling down” period. 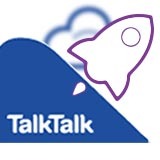 Sky Talk offers two main strands of calls packages. Inclusive Evening and Weekend Calls will add £4 to your monthly bill, while Anytime Calls costs an extra £8 a month. All of Sky’s current call prices are here. Sky fibre comes in three varieties: Sky Fibre, offering up to 38Mbps with a 25GB download limit, Sky Fibre Unlimited at the same speed but with unlimited data, and Sky Fibre Max, which gives you speeds up to 76Mbps and comes with unlimited data. Sky was one of the first providers to promise a guaranteed minimum speed on its fastest Fibre Max plan. If you can’t receive a minimum 55Mbps download speed on Fibre Max, Sky will offer you the option to cancel with no early termination charges, or move you to one of its lower speed deals, Sky Fibre Unlimited Plus at 52Mbps or Sky Fibre Unlimited at 38Mbps. Sky offer 24 month contracts on the latest Android and iOS phones, as well as cheap SIM Only plans starting from £5 a month. As of November 2017, there’s no way to add a Sky SIM to your broadband plan if you’re buying direct from the Sky website. According to customer services, this has to be done separately. Sky Q is Sky’s set-top box, offering three main types of bundles to get your Freeview and HD channels up and running. Each is an 18 month minimum contract. Each of the Original, Variety and Box Sets bundles comes with the Sky Q 1TB box as standard. With this you can record up to three shows and watch a fourth and store up to 500 hours of standard definition TV. The more expensive 2TB Sky Q box doubles your live recording and storage ability. You must return Sky Q equipment if you’re cancelling or switching away from Sky. If you don’t return the Sky Q Hub you’ll be charged £30, £50 for the Sky Q Mini, Sky Q 1TB is £100 and the 2TB version is a whopping £200. There’s a step-by-step guide here on how to return Sky equipment. Even the lowest-priced TV add-on includes 270 channels. 270+ channels including BBC One, BBC Two, BBC Four, ITV, Channel 4 and Channel 5, including HD versions and all the +1 catchup variants as well as Sky 1, CBeebies, CITV, Comedy Central, MTV, Dave, and international channels. 320+ channels including all the Freeview news and entertainment channels, Sky Atlantic (home of Game of Thrones) and premium kids channels like Nickelodeon, Nick Jr and the Disney Channel. All of the above including 55 HD channels and 350 Sky box sets. Sky broadband is not the cheapest on the market but it really shines if you want to bundle broadband together with the latest entertainment TV and sports and there are few better options for premium coverage.